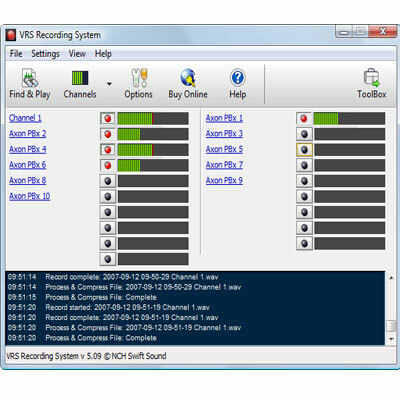 VRS Recording System for Linux is a professional digital audio recording application for Windows or Linux PCs. This multichannel audio recording software has robust design and simple interface making for fail-safe but user-friendly day to day operation. Recordings are automatically compressed for archiving and can be searched by date, time, line or other data from within the software or from your web browser if you enable web access. ...... data from within the software or from your web browser if you enable web access. * [Optional] Play a default or customized "recording started" prompt on computer when recording starts. Qweas is providing links to VRS Recording System for Linux 5.34 as a courtesy, and makes no representations regarding VRS Recording System for Linux or any other applications or any information related thereto. Any questions, complaints or claims regarding this application VRS Recording System for Linux 5.34 must be directed to the appropriate software vendor. You may click the publisher link of VRS Recording System for Linux on the top of this page to get more details about the vendor.